Nurse's week is coming up pretty soon, May 6-12th. Get pumped! What is Nurses' Week, you may ask? 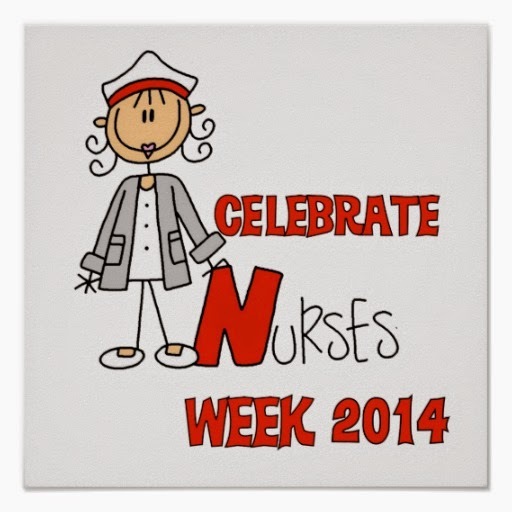 Nurses' Week occurs every year to celebrate nurses! Yay! The week coincides with Florence Nightingale's birthday (May 12th), who as you all should know, helped to establish nursing as a profession. Nurses' Week is supported by the American Nurses Association. It is time set asside to take notice of nurses, celebrate their role in society, educate the public on the role and profession of nursing, and to give us presents! Neat! So during that week I plan to post daily about nurses over on my nursing blog. Stories. Poems. Pictures. eCards. Your comments, stories, and encouragements are very much appreciated.